May 22, 2017: “Organic social media” – a marketing method in which marketers are able to reach their target audiences without having to pay a social network to deliver any messaging — naturally offers the highest ROI for marketers, which explains this channel’s high adoption rate. For users, however — and for the social networks hosting these users — the result of such high adoption is that any single newsfeed can become clogged with “empty calorie content” that promises much (usually in the form of a tantalizing, often surreal headline) but delivers little (because what’s on the other end of the URL isn’t worth the click). The situation has gotten so bad on Facebook that the service — whose management has long denied that it’s a “media company” is starting to behave more like a conventional publication in which editorial control is routinely exerted (although this control is delegated to an algorithm, not human editors, whose sole role appears to be to “train” this algorithm to behave like a human editor). Facebook now finds itself in a situation very similar to that which Google found itself in 2011, when the high output of content farms clogged SERPs with so much ersatz “organic” content that a number of prominent journalists wondered whether Google was on the road to losing its utility. The result was Panda, Penguin, and other algorithmic innovations whose sole purpose was to control spammy organic content. How should “organic social” marketers respond to Facebook’s crackdown? This, of course, is a very short list that scarcely scratches the surface of clickbait’s mighty corpus, but other phrases characteristic of the clickbait genre (“You’ll never believe…,” “Your jaw will drop…,” “This is unbelievable…,” “You’ll be shocked…,” “I have NEVER seen anything like THIS…,” “Just wait until you see…,” “…I’m speechless…” should be avoided. In fact one might go so far as to suggest that spurious all-caps headlines should never be a part of any headline on Facebook, given the risk that they’ll trigger a possible “all-caps” rule in the algorithm. 3. Save puffery and exaggeration for paid social media. Marketers who consider puffery and exaggeration to be essential elements in their marketing strategy should consider testing Facebook’s paid ad program, because at least they will know — on a case by case basis — why exactly their posts have been rejected. And even if these posts are rejected for being “sensational,” “false and misleading,” or otherwise running afoul of Facebook’s long list of proscribed commercial messaging, at least there will be no penalty for rejected ads in the form of decreased organic reach for the marketer. 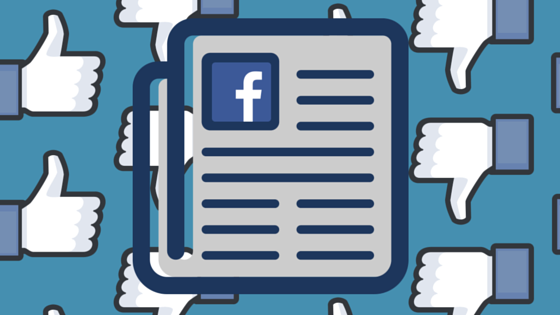 Facebook changes algorithm to battle clickbait and "empty calorie content"
Facebook's recent modification of its News Feed algorithm puts marketers on notice to avoid several specific marketers of clickbait.